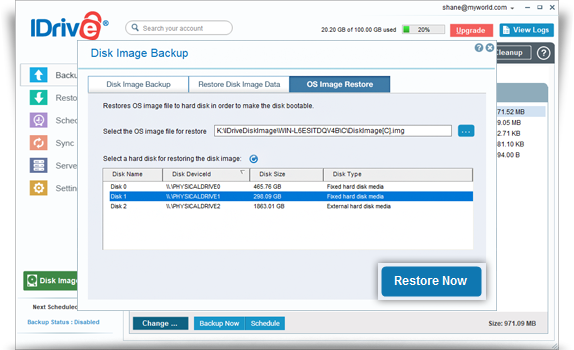 OS image restore helps you effortlessly restore your disk image files to a hard disk - at the click of a button. You don’t need a recovery environment to restore your image file to a new hard disk, in order to make your OS (operating system) ready. 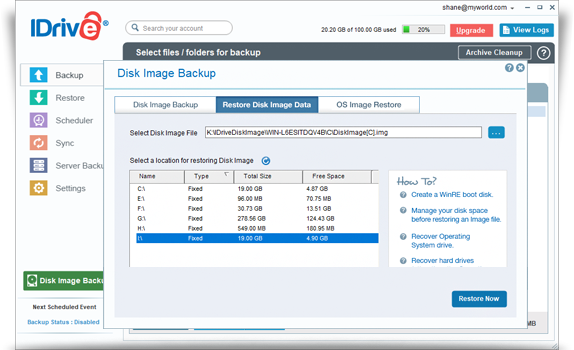 With OS image restore, all you have to do is log in to your account, and select the disk image file and hard disk for restore. Once the restore is completed, select your hard disk in BIOS and boot your computer, to get your system ready. Download and install the IDrive application. Log in with your Username and Password. Note: If you had set a private encryption key for your account, then provide the same here. Click Disk Image Backup. The Disk Image Backup screen appears. Select the OS Image Restore tab. Click and select the operating system disk image (.img) file, downloaded from your online account, to restore. Choose the desired hard disk for restoring the disk image. 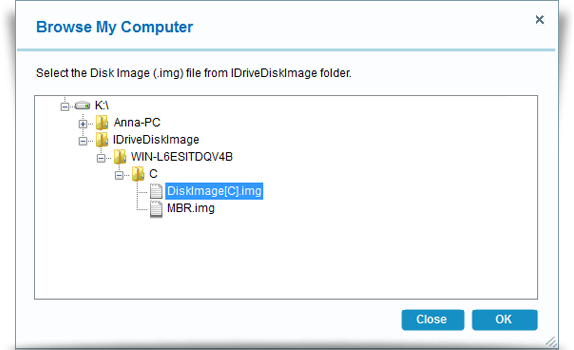 Note: Restoring a disk image overwrites all the existing drive contents with the image file. You can also restore the disk image file easily to the drive. Select the Restore Disk Image Data tab. Click and select the disk image (.img) file downloaded from your online account, to restore. Choose the desired drive for restoring the disk image. Click Restore Now. After restore is complete, click View Logs to view the restore details. Note: Restoring a disk image overwrites all the existing drive contents with the image. Click here to view Backup Instructions.